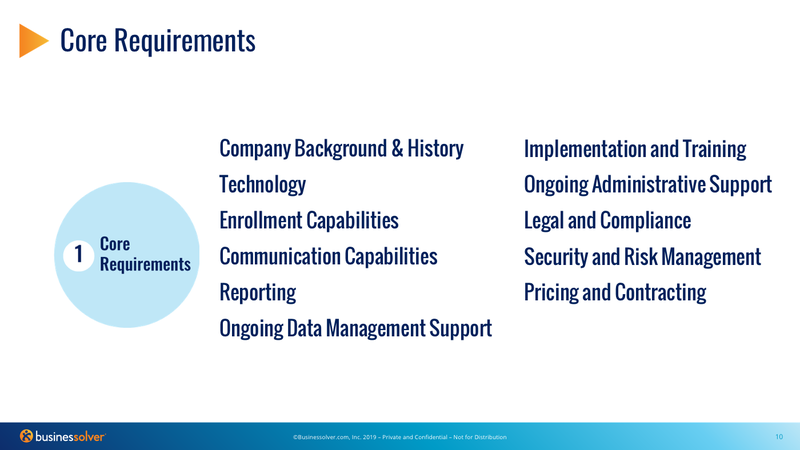 Now that you have your RFP core requirements covered from our past video, now you should start thinking about the additional requirements you may need to scale your organization or expand your offerings. Think COBRA administration for example. Hello again, and welcome to the fourth installment in our series Conquering RFP Writer's Block. 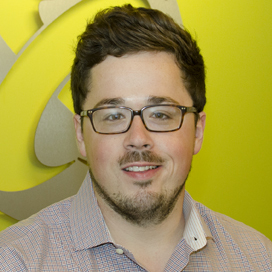 For those who don't know me, I'm Ray O'Donnell VP of Professional Services Ops and Sales Training. 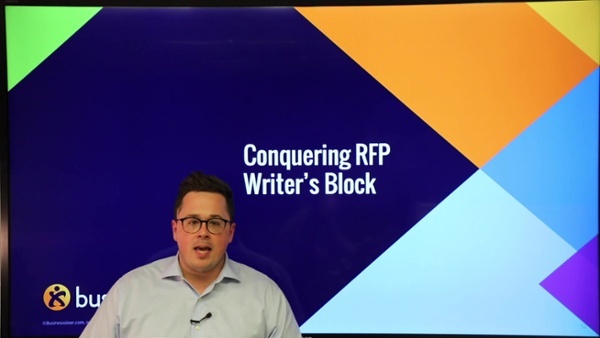 In this installment, we're taking an in-depth look at some points we outlined in our white paper, The Art of Writing an RFP. The focus of that white paper and this video series is on benefits administration technology and services. However, any of the points that we've shared could universally apply to any RFP process that you may be completing. Today, our focus is on additional requirements that you may need to include in your RFP. But first, I want to take a second and remind you about the core requirements that we discussed in a previous video. You don't want to forsake the core requirements for any additional requirements, or "nice to haves." In other words, you should focus on understanding the goals you're trying to achieve during this RFP process first and align those in your core requirements. Once those are established, you can start thinking about any additional requirements you might need. Questions to ask yourself when thinking about additional requirements. When thinking about additional requirements, think about the things outside of your core scope that may be beneficial or creative that could help achieve your goals. Some example questions to ask yourself: what are we doing in-house today that we may want to outsource? What do we have split across multiple vendors that could ultimately be consolidated? Or, if the way our benefits administration is structured is working, how are we going to make sure we honor the requirements of each provider moving forward? Could we get more favorable pricing if we looked at it differently? Overall, it's respecting this RFP process for what it is. The opportunity to completely transform and innovate your benefits administration process. Let's dig in just a little bit more on some of these additional requirements. There are eight things you see here on the screen behind me. As a reminder, in our Art of Writing an RFP white paper, we have sample questions related to all of these topics. You don't want to use them all, but they are a great place to help you understand where to start. They are super helpful and will start that spark to get you going. 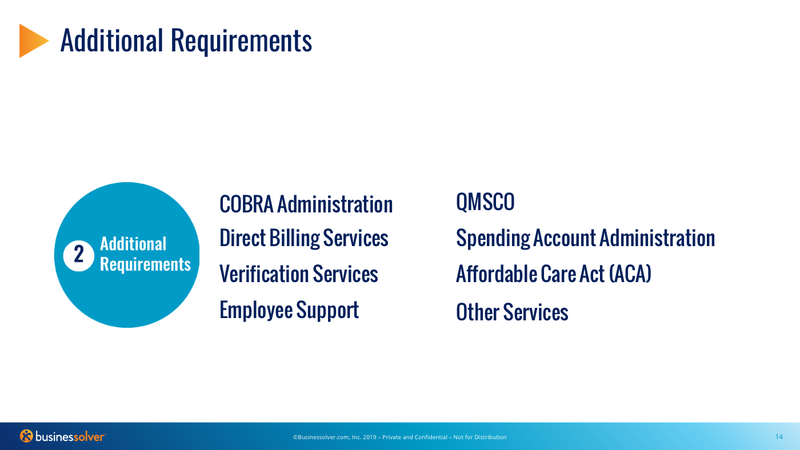 Now I'm going to dig in more specifically into two of these eight requirements beginning first with COBRA administration. I want to specifically highlight COBRA administration because it's great place to stop and think about what you are trying to accomplish with your employees' experience. What do you want this process to like like in the end? Do you want to have a continuous experience for your active employees to your COBRA participants to your retirees? Or again, are you comfortable having each experience broken out? If you are doing your COBRA administration in-house, this is a great opportunity to assess and ask, "is this truly how we want to spend our time?" Other questions to ask yourself: how are you integrated today? How are you doing any sort of sign ons? How are you reaching employees that have now joined your alumni network? Again, there's many things to think about and consider within COBRA administration, but the general idea is to take this opportunity and slow down to think about your processes and how they're working or not working. If you are putting the employee or the member first, are you really driving the type of experience that allows you to differentiate and achieve the things that you want to achieve? The next bucket I want to talk about is "Other Services." Other services can be incredibly broad. It could be 5500 reporting. It could be an appeals process. That could be specific to 1095s and ACA. Maybe it's a process you want to put in place if someone misses a window. Or maybe you want your employees to do something specific after annual enrollment. The general idea behind other services is, again, to look at what you're doing and ask: does it still make sense for us to do this? Use this RFP process to ask yourself what you and your team want to focus on. Maybe your new technology partner can help with some of your processes while you focus on what truly matters to your organization. That's all we have time for today. If you missed anything, you can go back and review all three videos on our website or at the top of this blog post. Share with any of your colleagues involved in the RFP process. We want to make this resource available to everybody who's going to have input whether it's across the entirety of the project or simply a stakeholder who is going to be involved in your additional requirements gathering. Also a reminder, please go out an download the white paper, The Art of Writing an RFP. It's available right now on businesssolver.com/rfp. I also want to thank you for spending your valuable time with us. Miss out on the previous episodes?